In British Columbia, places like Squamish and Skaha come to mind when people talk about superb rock climbing areas. But hiding up in the stunning north, in the depths of the Giscome bluffs are fun, challenging, and visually stunning crags of all types that make Prince George a hidden climbing gem. It’s early spring and we have been itching to get out all winter long. There is something about this sport that becomes highly addictive, always craving harder routes and higher climbs. We head to bed, with all our gear loaded, ready for an early start. We awake at 6am on a warm March morning, prep food for our crew and head out for the first climb of the year. We chose Giscome Crag to start our season off. The morning sun greets us on our winding drive out towards the McGregor Range, and as we approach Eaglet Lake, we see from afar that we are in luck with clear rock insight. Hiking with climbing gear has its own challenges. Approaches can require tricky maneuvering to get into that prime slab spot. Looking at our route options, there is slab, cracks, top-rope, and sport climbing all to be had in the section we chose for the day. This spot allowed for our varying skilled climbing crew to all have an outstanding first climb. We get set up and begin the day. After sending a few routes, each with an incredible view, we take a well-earned break, resting on the rocks, surrounded by the snow. Signs that spring has arrived and another great season has commenced, fill the air as the sun shines down on us, giving us that first terrible sunglass tan of the year. We pack up our gear and move on to the next rock slab to conquer, hiking through snow to get to the next spot in the sun. Spring climbing doesn’t get any better than this. The bonus of the Giscome climbing area is you can set up camp on Eaglet Lake, making it a full-weekend adventure trip. Multiple rock crags in the area are within a quick hike, or a few minutes by car. Camping allows you to wake up with the sun and be only seconds away from your climbing spot. Take a dip after your climbing day, or bring along your canoe, kayak or stand up paddleboard, and enjoy exploring this large, yet shallow lake with views of the McGregor Range. If fishing is on your wilderness hobby list, pack your rod as you will find feisty Rainbow Trout and lurking Burbot here, too. Rock climbing is not just for the extreme sports junkie. Climbing is an excellent activity you can do with the whole family, and the Prince George crag scene has something for everyone. With a packed lunch and a safety talk before proceeding, there are many outdoor climbing areas you can share the love for this cardio-blasting sport and serene outdoors with every member in your crew. Not ready for outdoor climbing yet? Overhang, Prince George’s local climbing gym has you covered. They have gear rentals, training, auto-belays, and year-round climbing to get you started or keep you in climbing shape. (We always recommend training and practice with other skilled climbers before trying out rock climbing on your own). The Giscome Crag area is truly a hidden climbing haven that needs to be on every climber’s list. Whether you are a northern local or just traveling through, make sure your gear is ready to rock, and check out the Prince George climbing scene. Bring along your kids for a family climb and ledge-side picnic with a view, or hang out with friends, pushing each other to send that upside-down rock staircase. You can find out more about the Giscome climbing area in the guides provided by the Prince George Section of the Alpine Club of Canada. Hello, my name is Ellie, and I am a 2.5-year-old Husky/Collie/Shepard. I will be telling tails of my experiences at the dog parks in Prince George and give you some insight on which ones are best suited for your furry companion. Corporal Darren Fitzpatrick Bravery Park: This is Prince George’s newest dog park and is located on Glenview Drive in the Hart. I like going here when I’m in the mood to play with other dogs. Furtunately, there are two separate areas so I can play with the dogs that are more my size and energy level. The park also has some great perks for humans including a skate park and playground. Duchess Park: This is another park where I visit when I want to play. Duchess Park, like Corporal Darren Fitzpatrick Bravery Park, has two distinct fenced areas: one for big dogs and one for small dogs. This is a wonderful spot located near downtown, and even has a water fountain for us dogs! With a mini bike track and a fully accessible playground there’s mush to see and do at this park. Moore's Meadow Nature Park: This is a great spot to hit the paws button and escape the bustle of the day-to-day. Be sure to keep us on-leash while on the park’s trails, then let us off-leash once in the open meadow. This is the best place in town to fully stretch my legs! There are a few different access points to get to Moore’s Meadow, Foothills Boulevard and Zimmaro Avenue are two of the best. Ginter's Meadow: Ginter’s Meadow is the park I go to most often! You can access the off-leash area via parking lots at the end of Massey Drive or Ferry Avenue. This park has a paved path where my owners’ can walk while a chase rocks and sticks in the long grass or snow, depending on the season. If you take the path up the hill, you will find the remnants of Ginter’s mansion, and a seasonal stream to stop at for a drink. I recommended heading here in the morning or early afternoon, to stay in the sun. If you’ve got a favourite spot that I forgot, let me know and I will make sure to check it out with my owner! 1. Visit Huble Homestead for Spring on the Homestead (May 20 & 21): Kick off the 2018 season by learning about different tasks that pioneers completed to ensure the rest of the year was a success. Activities include planting the garden, making ice cream, and the May-Pole dance. There will also be a treasure hunt to complete and local music to enjoy. 2. Take a Ride on The Little Prince: Saturday, May 19 is The Little Prince’s first day on the tracks in 2018 (weather permitting)! Visit The Exploration Place in Lheidli T’enneh Memorial Park and enjoy this classic and affordable ride. Tickets range from $1 to $3.50 per person. The train will be operating from 12pm-8pm. Enjoy some Frozen Paddle Ice Cream from the Scoop Shop while you’re there. Update: We just learned through The Exploration Place's Facebook Page that The Little Prince will be delayed from opening this weekend. Visit their Facebook post to learn more. The good news is that they will still be selling Frozen Paddle ice cream! 3. Visit a Park: Prince George has so many incredible and beautiful parks to enjoy. Some favourites include Lheidli T’enneh Memorial Park, Connaught Hill Park, Wilson Park, Rainbow Park, Wilkins Park, and Goodsir Nature Park. All of these places make for a great place to enjoy a picnic and the beautiful weather. 4. Shop at the Farmers’ Market(s): Pick up fresh, local food for your picnic in the above mentioned parks from either of the two Farmers’ Markets in Prince George on Saturday. Both Markets are in new, spacious, and welcoming locations: the Prince George Farmers’ Market is at 3rd Avenue and Quebec Street (inside and outside) and the WS Farmers’ Market is at Pine Centre, outside of the old Sears location. 5. Go Fishing: Gather family and friends and spend some time at the lake. The Prince George Visitor Centre loans out fishing rods and tackle for free, all you need to do is have your fishing license. Stop by, pick up your gear, and head out to the lake. Not sure where to go? We also have a handy pamphlet featuring ten fishing lakes in the Prince George area available at the Visitor Centre or online. 6. Enjoy Horseback Riding: Just thirty minutes south of downtown Prince George is El Shaddai Ranch. Call ahead and book a lovely two hour trail ride with a friendly herd of horses. Your ride will weave through meadows and forests and a viewpoint of the Baldy Hughes area (a perfect place to take pictures). 7. Join the Prince George Sikh community as they celebrate Vaisakhi: There will be a colourful parade starting at Guru Nanak Darbar (4298 Davis Road) at 10am and will stop at the CN Centre from 12-2pm. At the CN Centre there will be announcements, displays, and food booths (including samosas, pizza, and sweets). This parade celebrates the Sikh New Year and founding of Khalsa, Order of Sikhism. North: Hartway RV Park, Northland RV Park, Summit Lake Resort, and Crooked River Provincial Park. East: Purden Lake Resort and Purden Lake Provincial Park. South: Sintich RV Park, Northern Experience RV Park, Bee Lazee RV Park, Mama Yeh RV Park, Stone Creek RV Park, Canyon Creek Campground, and Ten Mile Lake Provincial Park. Since this weekend is such a popular camping weekend we strongly suggest calling ahead to make reservations to all private campgrounds. Note: West Lake Campground opens on June 1. Salmon Valley Campground will also open in June. Whatever you do this long weekend, we hope you have fun enjoying Prince George and stay safe. Need to brush up on your knowledge around having a safe campfire? Check out our recent post with information from the Government of BC regarding fire safety. On Friday (May 4) we visited a few of Prince George’s most popular walking areas to learn if the trails still had snow, were muddy, or were dry. We visited Cottonwood Island Park, Forests for the World/Shane Lake, and LC Gunn Park. While we only walked to the first lookout at LC Gunn Park, that trail seemed to be in the best condition following winter. Keep reading to learn a little more about the conditions at each location and to see some pictures. A perennial favourite, Cottonwood Island Park is a great place to visit for a lovely stroll along the Nechako and Fraser Rivers. We parked in the parking lot beside the Railway and Forestry Museum and started off across the Cameron Street Bridge Replica to the Nechako River. The trail varied between being slightly wet to muddy but in places where the trail is paved it seemed a little better. We did not walk the all of the trails but we anticipate that some detours may be in place due to the high level of water in the rivers. Keep your family and pets safe by not getting too close to the river bank as it may be unstable. Overall, Cottonwood Island Park is always a lovely place to visit and the mud would not prevent us from going back (we’d just make sure to have good shoes on). Note: During the spring melt, the rivers may surpass the riverbanks and flood the park. Visit the Parks, Trails, and Field Closures section of the City of Prince George's website to see if Cottonwood Island Park or any other of your favourite recreational areas are closed. We took the quick walk from the parking lot on Kueng Road to Shane Lake and the trail still had some snow and puddles on it. There was one point where a large puddle covered the majority of the trail and we had to skirt along the path’s edge to keep our feet dry. However, Shane Lake is completely ice free and next time we’ll have fishing rods so we can cast into the lake from one of two docks. Don't have your own fishing gear? We loan out rods and basic tackle for free, all you need is a fishing license! Forests for the World can also be accessed from a parking lot near the University of Northern BC on University Way. We walked a short distance down this wide and well-maintained trail and the conditions that we experienced were surprisingly dry, better than the trail from Kueng Road to Shane Lake. However, we did not follow the trail all the way to Shane Lake, so we’re not sure on its condition as it weaves through Forests for the World. Located just across the Yellowhead Bridge going east from Prince George, LC Gunn Park gives hikers wide views of Prince George, Connaught Hill, and the iconic Prince George cutbanks. Due to time we only walked to the first viewpoint and the trail was the driest we had seen all day. While we were there we saw some people out for a bike ride with their dogs and the dogs didn’t seem too muddy, so we’re thinking the rest of the trail is in a similar condition. 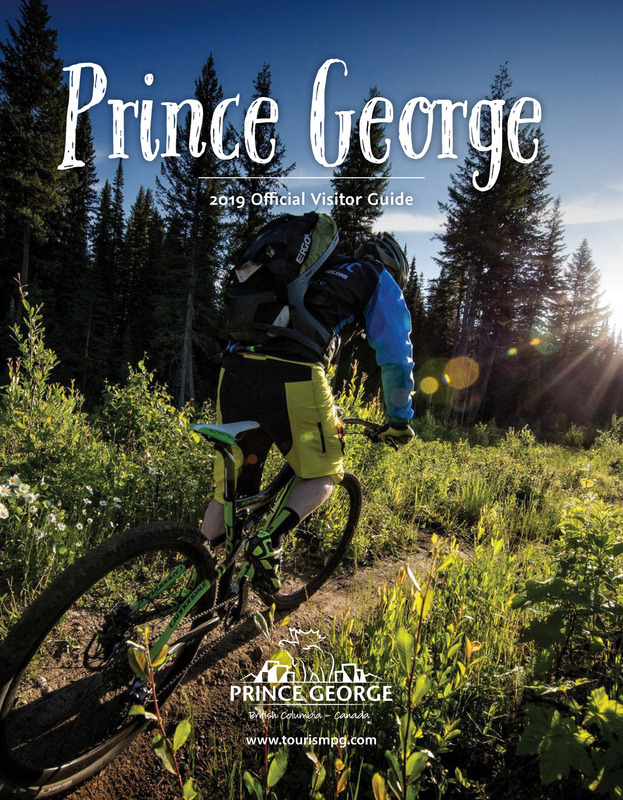 Do you know about the condition of other parks and trails in Prince George? We’re also eager to know which lakes are completely free of ice. Let us know by tagging your photos with #takeonPG on Instagram and Twitter or posting them to our Facebook Page.